Last semester, I was given the opportunity to build and coach a team to take part in the Sustainability Report Competition. This competition is not only constructive but also very exciting! In fact, for the first time it is university students who are the jury and are judging which Canadian company has the best #Sustainability report. For each specific industry sector (Energy, Finance, Materials, Consumer Products, etc. ), a jury is composed of students from different universities. In this year’s edition, there was a team from Concordia, HEC Montreal, UQAM, McGill and Sherbrook. Each group of students was given a set of Canadian companies belonging to a specific sector. The students should then conduct an assessment of the most recently published sustainable development reports of all the companies in the sector. Each jury is free to determine its own selection criteria. I was able to gather 5 members on my team form the McGill mining engineering program. We were responsible of choosing the best sustainability report among 12 reports belonging to Canadian mining companies. After brainstorming, we ended up with a list of criteria that we thought are essential to make a great report. The first part of the criteria was focused on the report format, how easily the report transmits the information. Some categories included accessibility, the use of GRI index and the visual. The second part of the criteria was focused on the corporate sustainability strategy. Some of the criteria related to the stakeholder included evidences of positive impacts on the community, local contractors, the company’s efforts to be socially involved with the communities where it operates as well as the handling of complaints. Another important criteria regarded human rights. We were looking for programs or examples of efforts in human rights especially for mining companies operating in sensitive countries. Some of the criteria specific to mining also included safety in the workplace, safety trainings, safety awards programs and handling of employee complaints or work refusal. Last but not least, the environment is an issue particularly important for mining companies. We gave emphasis to information relative to waste management, water issues, and consumption of natural resources. We also gave some importance to details on the reclamation plan and the number of inspections, if there were any. Once we determined the criteria we could proceed into reading the reports. Before doing so we established a methodology. Since we were five working on the Canadian mining companies, as our first step we divided the 12 reports between each other and each one of us ended up reading 2 to 3 reports and choosing the best one among them. At that point we were left with 5 reports. The second round consisted in reading another 2 reports. One of my team members decided to focus on three international mining companies’ reports although it wasn’t part of our job! Nevertheless it was interesting to see the difference in reporting! We were impressed by three reports that in our opinion stood out. Our three finalists were Goldcorp, Kinross and Teck Resources. The competition ended with a luncheon where each group of students gave a quick presentation of their work and presented a trophy to the winner. 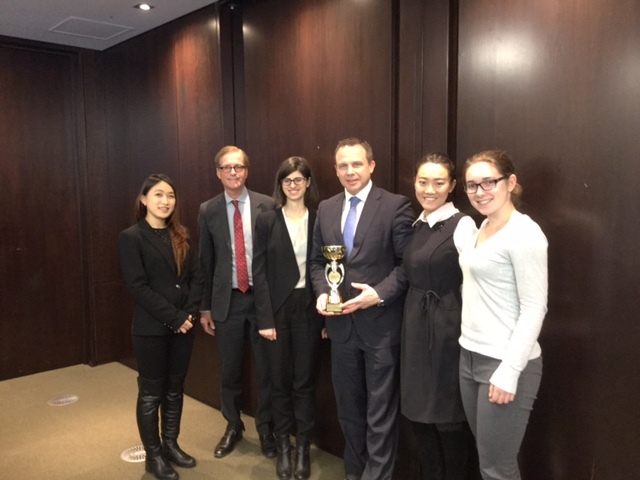 We decided to give the trophy for best mining sustainability to Goldcorp and presented a trophy to Goldcorp VP of Corporate Affairs and Sustainability, Brent Bergeron. It was a great experience from all the McGill mining team! I hope this competition will encourage the mining companies to increase the extent and detail of the reporting they provide. Because in mining like in other industries you can’t manage what you don’t measure!